Showing results for tags 'seapony'. 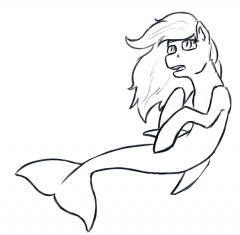 Re-upload of the random picture I drew of a sea pony to practice my shading techniques. The skin came out really nicely, but the hair was a huge hot mess. My ability to shade hair tends to fluctuate wildly when it comes to painted pictures, I've yet to really settle on one set technique. Name: Nipnip Gender: Female Age: Young Mare Species: Hippocampus Eye colour: Teal Character colour: A light lavender, with blue gradiant near her shoulder blades. Mane/Tail/Other: Her mane is style in a short fringe that goes down her hairline on one side. it's the same colour as her eyes, teal. running to the end of her neck. 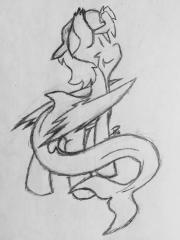 Her shoulds blades are the start of two symmetrical fins that decrease in size to where a pony's back legs would be. Her tail is whale-like, and her hooves have two decorative teal fins travelling upward. Physique: Smaller and more lithe then her spawnling sisters, Nipnip's slender frame makes for fast escapes, but she's more of a marathon-swimmer then a sprinter. Residence: The coral reefs of the warmer western oceans along Equestria. However, she does enjoy travel. Occupation: Due to her frame, she was chosen as a scout and lookout for her swarm. However, this is a job she's often found away from. in her spare time, she watches the ponies and their strange behaviour. Cutie Mark: N/A Unique Traits: A slender frame and the ability to use echolocation, like all hippocampi. History: Spawned in the coral reefs of her homeland, she grew up under the eyes of Shellbeard, an aging dominant. when the swarm got too large (they often do) she split up with Nevidia, Shellbeard's youngling. They traveled further down the coast, towards more pony-habituated territory. Character Personality: A Quieter soul, Nipnip is more intrested in observation. However, she's prone to probe where she shouldn't. Disobedient, Nipnip doesn't have much knowledge about pony language other then basic phrases she's been taught, and is quite forgetful. Character Summary: A Hippocampus of discovery, Nipnip is facinated with the unknown, which has brought her into many a danger. Name: Azalea Gender: Female Age: Adult Species: Seapony Eye colour: French rose! Like the rest of her body, she really likes the color pink. So she's at least grateful to be covered in so much of it! Character colour: Pink w/ rose 'tiger stripes', likely makeshift camouflage just in case any predators happen to wander into her area. Mane/Tail/Other: Crimson colored mane, though she tries to highlight it with what she can from time to time. Often another shade of pink. She really likes pink. Physique: She's in shape, but not overly toned. She's a very laid-back creature and doesn't often exert herself as much as she should. Residence: She lives in a reef near the shore of Manehattan Occupation: She tends to her personal 'garden' of undersea flowers, anemones, urchins, coral, and other such things with pretty colors. Cutie Mark: A bright, blossoming Azalea, with four sparkles around it. She doesn't even know what an Azalea is, but her mother tells her her namesake is after a beautiful flower an Equestrian trader showed her once when she traveled. It looks pretty anyway. Unique Traits: She adores all aquatic life, from the nastiest shark to the prettiest little seahorse. Yes, she even loves the Red-Lipped Bat Fish. She likes to interact with them all, and makes colorful homes for most of them in her own little piece of underwater heaven. As kind and ever-loving she is, she has a dark side. Dun dun dun. Or, more like she has a curse! And it's not all that dark! When she was young, a sea witch put a curse on her, for reasons she's still unaware of to this day. This curse? Nothing. Except when anypony mutters certain words, she'll uncontrollably burst out into song! It could sometimes come at very inopportune times. The plus side to that is at least she has a nice voice. History: She was born among 7 other siblings within the Quagga Strait to two loving parents; her mother, Amaranth, and her father, Keelhaul. Her father was always a rough and tumble type, very aggressive toward other creatures. Though he thankfully had a tender side for Amaranth and his children. They were usually left to wander around with their mother, sometimes gathering food, other times learning how to make little shelters, or just playing in the seaweed. But Azalea had always been drawn to more gentle things. Things with bright colors and tender motions, like an anemone's tentacles flowing to and fro in the water. She also liked to go up to other fish and creatures with pretty colors, sometimes needing to be pulled away by a worried mother. Curious, definitely. It was this curiosity that made her find her real passion! She saw all the pretty flowers under the water, colorful blossoms, tentacles, leaves, rocks, everything! She liked to collect them and hoard them, often making little gardens for herself, as well as keeping several little creatures as pets. She, she had to be rescued a few times from a crab that pinched a bit too hard and wouldn't let go, but her mother thought it was darling regardless. Though she was also made to put back things like hermit crabs, urchins, and other things that she plucked up because they were pretty. Her mother told her she couldn't take them from their homes! So clearly the best way to solve this was to make them better homes, so she could see all these pretty things all the time! But some things weren't so simple as just picking them up and moving them. They could die! Over several months, she made great efforts to create her little condominium not far from her home. Moving rocks into perfect formations with anemones still on them, replanting seaweed, and even being patient enough for barnacles to find their way there. She arranged it all just right so that the colors were so vibrant, so beautiful, that the creatures had to come! She waited! And waited! And waited... But soon, nature responded! They came! They came!! She was ecstatic to see, one by one, little sea critters being drawn to the little homes she had made! It was hard to tell with fish, but they seemed happy! That made her happy! Seeing all the pretty colors, and little fish swimming about, even the hermit crabs came back, and changed their shells with the ones she picked out! It was touching to her, especially since this was a fever project she did on a whim! But this fever project also produced a cutie mark! Her mother told her it was odd, since the mark itself is a land-based flower. But she didn't mind it. It was still pretty! It represented her love for natural beauty, kindly attitude, and colorful preferences! As she grew older, she was soft spoken and mild-mannered, but she could appreciate the beauty in almost anything. For some reason, this seemed to draw a bit of ire to one particular creature she encountered. One day, swimming alone, she had trespassed on the territory of a sea witch while looking for things to add to her garden! The witch remained in the shadows, but scolded her for her supposed insolence! Needless to say, she was terrified for this witch, and didn't dare try fleeing. She was then cursed! Oh no! But it wasn't until after she fled that she found out what the curse actually was. Interacting with family, at times she would suddenly burst into song! Songs she didn't even know before, some pretty, some intense, some annoying! It came at pretty inappropriate times, and nopony knew how to rid her of this curse! She went with her father back to where she first encountered the sea witch after the singing had become too much to bear, but she was no where to be found! Not knowing what to do about this curse, and not wanting to inconvenience her family, she decided to move from her family home. Of course she made sure to promise she'd visit from time to time! It took a day or two of traveling, but eventually she reached Seasaddle Bay, and decided to set up shop there. Why? Because there was a beautiful coral reef that make a nearly perfect clearing under the water, in a neat circle! She made her home there in the sands around the colorful coral, and started a brand new garden! The sun shines effortlessly in that spot, and she loves the solitary atmosphere (save for passing ships and fishergryphs from time to time). Now, she tends to her garden and mostly keeps to herself. After all, she has all the friends she needs with all her sea critters living around her! Character Summary/Personality: She is soft spoken and timid, though shows great, genuine enthusiasm for her gardening and finding something she thinks has beautiful colors. If she can help it, she tries to keep her interaction with others to a minimum, else her curse come to surface yet again. At some points, however, when her curse is triggered, she had been mistaken for a siren under the water, leaving some superstitious fishergryphs a bit wary of her domain. Truthfully, she absolutely horrified of going on the surface, and even more so of getting accidentally caught in a fishing net. Knowing this gryphons, they'd probably eat her anyway! She didn't want to get stuck in a net, suffocate out of water, and get eaten! That was horrible! So, she does her best to stay in her garden, surfacing only when she's sure the coast in clear, or when she wants to look onto the shore or the horizon. She hopes to one day actually see this precious flower that is her namesake and cutie mark. It must be even more stunning up close! Name: Naia Gender: Female Age: Mare Species: Sea pony Eye colour: Intense cerise pink. 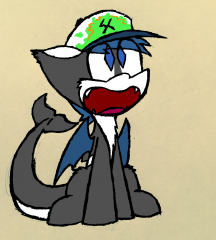 Because Naia comes from the dark depths of the ocean her eyes are without pupils and rather spooky! Character colour: A very dark green-blue, with glowing cerise spots running in two lines which outline her “under”side from the bottom of her chin down to the very tip of her tail. These glowing spots also dot the edges of her fins. On her neck, chest, belly, and fins there are dark washes of pink as well. Mane/Tail/Other: Naia’s long mane starts the same deep green-blue of her body at the roots then fades into the same wash of dark pink that colours her stomach and fins. She never styles it, simply lets it undulate freely in the ocean currents. Her tail holds many similarities to that of a betta fish - it is long, flowy, and quite ornamental. Physique: Naia possesses the sleek, toned figure one would expect of a creature who has spent her entire life swimming. She is almost constantly in motion, whether swimming through still water, drifting with the flow, or fighting against the undersea currents. Residence: The deep oceans east of the Gallopocus Islands, in a drifting bloom of comb jellies. Recently, however, she is something of a wanderer closer to the surface. Occupation: Naia is a keeper of ctenophora (comb jellies). Though the bizarre, delicate creatures may seem mindless and meaningless they are strongly connected to the magic of harmony found within the ocean. Caring for these creatures that she so admires also presents Naia the opportunity to study and understand the role they play in the big picture of harmony and the flow of aetheric energy. Cutie Mark: The ghostly image of a beroida comb jelly. Naia was born and raised in the dark, silent expanse of the deep ocean. She was raised there by her parents: her mother who lived to study the fascinating world of anglerfish and her father who was a thrill-seeker and giant squid tamer. Naia was their only foal, and as such they doted on her quite a bit. Well, as much as any seapony living in the deeper reaches of the ocean can; their sort have a much colder demeanour than their lively kin who live closer to the surface, if only for the fact that they spend so much time on their own. Her father was always the exception to the rule of deep sea seaponies, however - he was loud, warm, and friendly. Always bragging about how his daughter was the cutest daughter in the whole history of daughters! So while her mother busied herself chasing angler fish and studying them, Naia’s father took it upon himself to teach his daughter the fine art of giant squid wrangling and taming. Well, “teaching” might be a more apt way of putting it. He would swim out to local squid haunts, pick out a little baby one to take back with him, and then just throw Naia at it to have her “tame” it. The baby squid were so harmless, though! There was no taming a “ferocious baby squid.” They always just wanted to wrap their tentacles around her and hug her and blow bubbles at her! It was all terribly boring. And then their mothers would always come ‘round for them and chase Naia’s father so far away it’d be a day before he made it home again! It was during one of her father’s longer stints away from home after being chased off by an angry mama squid that Naia felt her first urges to drift away from the little stretch of water she called home. Her father always returned with stories of fascinating things he saw while he was away, so this time when he came home she wanted to surprise him with a story. So away she swam, without informing her mother, into the vast, mysterious world of the deep ocean. At first it was incredibly boring, full of a whole lot of nothing aside from little buggy sea critters she saw all the time back home. Further and further she went into the darkness, until a glow began to appear in the distance. Curious, Naia sped towards it, eager to find what fascinating stories awaited her there. She was not prepared for the beauty she would find. A huge field of glowing and undulating jelly bodies spread out before her, the bloom so large that she could hardly see where it ended. She had seen ctenophora, before, but never like that. There was something magical about them and the strange, soft vibration of aetheric energies in this huge bloom of jellies. Naia was utterly and irrevocably enchanted. She drifted into the bloom, swimming and whirling about with the jellies, laughing and singing as she never had before. As she swam her way through the bloom, eventually she ran into none other than her father! He laughed too and wrapped his tail around her lovingly, saying that he heard her voice on his way back. And then, best of all, he pointed out the ghostly image of a comb jelly that had appeared on her side! Her cutie mark had appeared, and it was one she was terribly proud of. Unique Traits: Like all seaponies, Naia is empathetic towards and can communicate with most sea creatures. She has a strong affinity towards comb jellies and jellyfish, however, and though those creatures have no language of their own she can command them with her singing voice. The jellies have a resonance with the magic that flows beneath the ocean, and using her singing voice she can connect to that resonance and with the creatures. It is a useful skill for a keeper of comb jellies to have, as it can help her herd them. It is also useful if she should ever come under attack, as. Comb jellies are more or less harmless, but with a large, stinging jellyfish at her side, most foes would think twice before rushing at her! History: Naia’s life after earning her cutie mark was altered significantly. The moment her parents felt comfortable she could fend for herself she was allowed to pursue her dreams. For the young mermare, that meant finding the jellyfish bloom that she had come across as a filly. It had drifted away from her home years ago, but the situation was not hopeless. After all, any seapony worth her salt water could get into the headspace of sea creatures, read the ocean currents, and make a good estimation of where they might travel. Her mission wasn’t an effortless one, however. A good estimation was never a solid lead, and so it took a whole year of travel and asking other ponies or creatures where her bloom had gone. When she finally found her jellies, she was happy as a clam! She stayed with them, cared for them, protected them, and studied them for some time before things began to change within the bloom. Jellies began to grow restless and agitated more easily, sometimes swarming her and pushing on her aggressively. Others would jitter and grow scared, and more yet would wander away from the safety of their swarm. It was frustrating, and Naia couldn’t make sense of what was happening. These were different creatures from the peaceful drifters she had met in her youth. After just one year with her ctenophora, Naia left once more. It was difficult for her to leave behind the little gels she loved so dearly, but she had to do something to help them. The agitation was growing worse and it didn’t make sense. What was happening to her lovely little jellies? It had to have something to do with harmony, with the flow of magic. The jellies seemed so connected with it that perhaps if she knew what was happening in the rest of the world, she would know how to help her friends. So now Naia has moved closer to the surface, where seaponeis live in boisterous communities and the ships of their surface kin break through the water above. It’s a strange, loud, warm place to be...and the ships! How strange! This is a world Naia has no familiarity with at all! Character Personality: Naia has a naturally cold and standoffish demeanour. Coming from the deep sea, where other ponies are rare to come across, she’s not really equipped with a great deal of social skills. The art of communicating with other seaponies is totally beyond her. Instead she’s blunt, to the point, and rarely mindful of whether or not something she says could be hurtful. She also possesses much less patience for other ponies than she does for her jellies. Her family is the only exception to that rule, and all other ponies she finds to be incredibly trying. Still, that’s not to say she doesn’t care for others - she just has no real way of showing it, beyond saying bluntly and flatly “I care about you.” That said, she still possesses the highly curious nature that all seaponies possess, and it helps draw her to a crowd even when her instincts tell her to go lurk in a dark corner somewhere. With little room for fear with all her fascination of the world, Naia will calmly swim into any situation to check it out. She’s also not afraid to ask whatever questions come to her mind, nor is she aware of the more sensitive nature of some questions. And even if she’s told that a certain topic is sensitive, well, she won’t even care! She’s more concerned about getting answers. Character Summary: Naia may not show it, but she’s a very passionate individual...about jellies at least. When it comes to other seaponies, she’s a little bit more cool-headed. Even with her empathetic nature, her lack of experience around other water-dwelling ponies (aside from her parents), just makes social sensitivity a little more difficult for her to grasp. That said, she is a stalwart friend to those who earn her companionship. She’s an excellent swimmer, has great endurance, and while she can sometimes be a little woozy when it comes to adjusting to life close to the surface (the pressure change can be quite the taxing experience! ), she is a very impressive athlete. Because of her cold demeanour and dark appearance, she possesses an air of mystery as well. Combined with her sleek body, it makes her quite the attractive mermare! The most outstanding quality Naia possesses currently, however, is a fascination with the surface. She is always prying and asking questions when she meets somepony new, and seems almost desperate to learn more. She has even been trying to catch the attention of passing ships by sitting atop rocks and islands above water and calling to them with her singing voice. Sometimes that seems to freak the surface ponies out, but most slow down and have a chat with her, answering all of her questions about current events out of water! An old drawing I did of my Octopony Octopie. She loves finding treasure! Your Cutie Mark is still listed as bubbles, I just noticed.